Do you have friends who look at the back of cross stitch projects you do and say, “The back is supposed to be as neat as the front you know”? I’m sure every cross stitcher has had that happen to them at some point, whether it was from a friend or a family member. Many people become disheartened with the hours they’ve spent on a project when they hear this claim (even from non-stitchers). 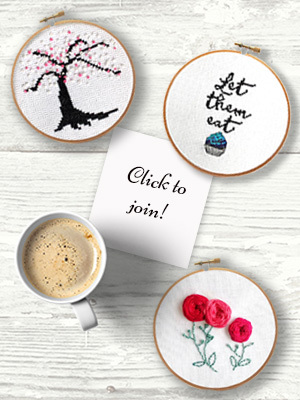 Some stitchers even quit cross stitch and embroidery forever, because they think they’re doing it wrong, or they feel so judged they don’t ever want to show anyone their work again. This is such an incredible shame! Nowadays, with all the many modern ways of decorating fabric and clothing, cross stitch and embroidery has moved from a functional craft to one of pure enjoyment and relaxation. To think that you’re doing it “wrong” completely defeats the whole point of creating a lovely stitched piece for relaxation and maybe even a piece of cherished home decor or an heirloom. 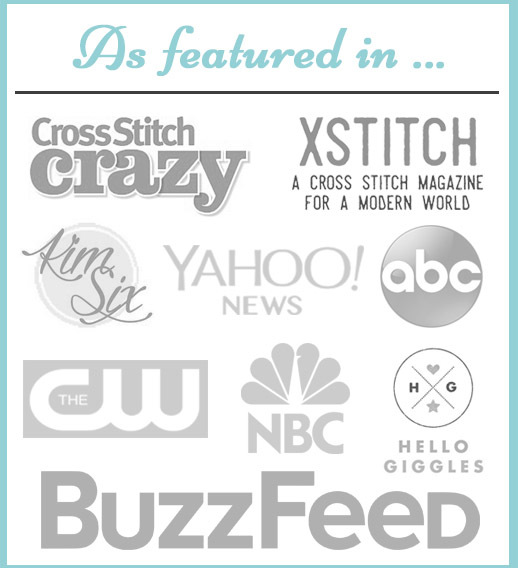 The topic of how neat the back of cross stitch pieces need to be is highly controversial, incredibly enough. Many admins of online forums and groups won’t even permit photographs of the reverse side of pieces, simply because people get very cantankerous and have very firmly held beliefs. It’s possible that this concept of having a neat back stems from traditional embroidery techniques. Some traditional styles of embroidery (like Italian blackwork) are indeed reversible. In that case, stitches like the Holbein stitch (or double running stitch) are used to create a fully reversible garment or project. Cross stitch on the other hand is not a fully reversible stitch, and the back will never look exactly the same as the front simply because of the way it’s formed. So, if you enjoy making the backs of your pieces look as neat as possible, please continue to do so! It’s actually amazing how many stitchers have the patience and skills to do that. But if you don’t want to worry about what the back looks like, please don’t! Stitching is meant to be enjoyable, and there are so many ways to stitch as each person is an individual. 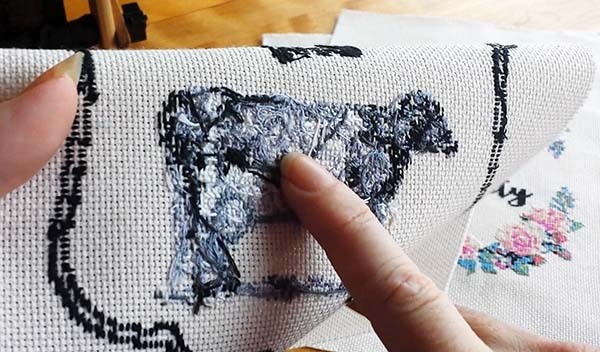 But there are instances when you do want to take care with what the back of your cross stitch piece looks like, and these are outlined in the video below. A summary of the tips can be found below the video, and links as discussed in the video. If you’re entering it into a fair or competition to be judged, they’ll want the back very neat and tidy. If you’re using very fine and delicate fabric with dark floss colours, you’ll want to not carry your floss too far across open areas or it will be seen from the front. You don’t want giant lumps of knots and tangles at the back, as they’ll make the front look lumpy when the piece is framed. If you travel really far between stitches without ending and restarting your thread, you may find you use up more floss (which may be a problem if you have a kit with a limited amount of each colour). If you have any questions or comments, or if you disagree with me, please leave a comment below! I’d love to hear your point of view! If you have friends who look at the back of cross stitch pieces and say, "The back is supposed to be as neat as the front you know", this tutorial may help! Also in regards to putting work into shows… because I have always done either framed pieces or ornaments I have the back covered anyway and it doesn’t matter what it looks like. I like to strive for a smoother back because it sits neater and doesn’t have any lumps when framing but that does not mean I’ll make my life harder just to save the back of the fabric. Oh and I park threads on my big HAED projects…. there is NO way to make that neat but the coverage on the front is so thick it doesn’t matter and it saves me so much time in the making! I always tell people not to worry about the back of the work so much. I have left quite a few Facebook stitching groups where members are ‘shaming’ those who won’t show the back of their pieces or lecturing those who have backs they think are too messy. Just enjoy the stitching and carry on! I stopped worrying about the back of my work, as my projects are for the home or a gift. For the most part, they look pretty good in back, but then you have French knots, start-and-stop ‘confetti’, wallpaper striping, a gazillion shades of one color, etc. Framing usually hides the back anyway. As long as the front looks beautiful when assembled into the frame or whatever, that’s the important thing. A piece of felt can be glued to the backs of hoops, etc. I’m self-taught and have actually gone in reverse directions to save time and stress, making sure the stitches are crossed correctly. Anything to keep enjoying this wonderful pass-time! I’m surprised you didn’t mention the fact that if you start a project at the top left hand corner and NOT THE MIDDLE your back will be much neater. Great for towels! I have wondered about the back. I wasn’t told when I had taken a class in counted cross stitch. The instructor didn’t tell me. Thank you! I am relieved to hear it. I am already half way through a piece and unfortunately haven’t kept it neat at the back (the piece is writing) and I’ve used a dark floss on white fabric so you can see it on the front. I am hoping to hang the piece so just wondering if you had any tips on how to now tidy up the back just so you can’t see the floss carrying through? Ahhh thank you Dana, that’s a great idea about the dark felt! Yes cutting now unfortunately may cause some unravelling …. I too try have the back of my cross stitch looking good. I’ve decided who cares if I’m going to have it framed and no one sees the back. I’ve made a couple of table toppers and was concerned about the back especially if I wanted to wash them. I have clear plastic over my table. This helps protect the top. I added a piece of fabric that matched the color of the table topper and I think it adds a lot to the table topper. I hide my needle work if I know certain people are coming as they look at the front and back and pass it around so everyone can handle it. I am super ocd on my backs! But I would NEVER crititcize anyone elses. Needlework is becoming a dying art because of non-sence like this. I also started with making mainly baby blankets and projects that would not be covered, as I have gotten older I have relaxed, I no longer take out stiches to make my back prettier. I say as long as there are no knots, who really cares! Thank you, thank you, thank you!!!!! I love to cross stitch. There is nothing so deflating as to have someone who doesn’t stitch comment on the back side! I rarely show anyone my projects until they are completely finished. When you are working on a small count fabric & multiple color changes in a small area it is difficult to have it as “neat” as on the front! I try to be as neat as possible when doing breadcloths, towels, bins, etc. We need to encourage our needlework friends! Haha exactly Paula, I completely agree! Next time someone comments, ask them if they’d dare to comment about how your backside looks. If they say no, tell them your project’s backsides are off limits too. 😀 Happy stitching! Good grief, I have enough trouble getting the front to look as good as it does. If anyone says the back should look as good as the front…..then they should cross stitch. No being critical. Thank you, thank you. I’m starting and I was really worried about how the back was going to be. But know I feel relieved. I want to enjoy my project. I really agree with you, I’ve always worried about the front of my cross stitch, and in time the back has slowly become neater, but I’m still not concerned about it.